What does it mean to love freely as the beloved child of God? How do we as followers of Christ actually live this out? What’s the process? 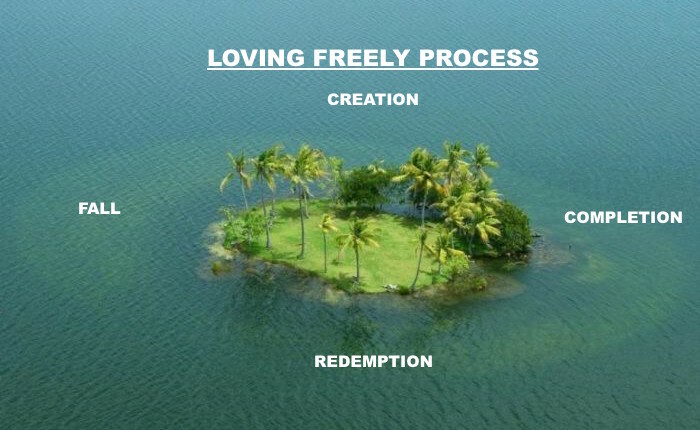 The loving freely process finds its roots in narrative theology of the scriptures; creation (Genesis 1-2), fall, (Genesis 3-11), redemption (Genesis 12-Jude) and completion (Revelation and Isaiah 65). Our story begins in creation in original glory with God. We were originally created to love freely. Adam and Eve loved each other fully. As Paul says in Philippians 2: 3-4; “Do nothing out of selfish ambition or vain conceit. Rather, in humility value others above yourselves, not looking to your own interests, but each of you to the interests of others.” Adam and Eve did this fully. They gave and received with joy, with God at the center of their lives. They were living out a fully dignified interdependent relationship, which means giving and receiving with Christ at the center. This is where our story begins. To love freely it’s essential to understand that we were created for glory in God’s kingdom to give Him glory. We were designed to rule and reign with him and as His image bearers we all have unique talents, gifts, callings and ways of being in this world. I would argue that in every element of trying to love and serve others, there are always glimpses of created glory, regardless of how poorly we serve. The next stage is where it all falls apart. Because of the fall we now love each other selfishly, with an agenda longing to prove ourselves to others and ourselves. Adam and Eve lied against each other and to God, thus being kicked out of the garden. For the first time in the Biblical narrative enmity was created between humans. Our false self has an agenda and so we use others to get what it wants. We don’t want to receive because we don’t like asking for help because we fundamentally don’t believe we are worth it. Loving poorly typically manifests itself in either codependency or narcissism. Codependency means we become attached to others changing and narcissism believes that we are the savior of the world, always right and a constant need to be in control. When we love selfishly it normally blows up in our face. People don’t give us what we want or react in a way that we didn’t expect. This is why it’s important to be aware of our triggers. Triggers are happening all of the time. We must be constantly be working through this grid of awareness when loving over serving others; What is the trigger? What is my response? What am I protecting? What is the root issue? But, thanks be unto God that he does not leave us this way in our sin of codependency and narcissism. He brings us out of our selfishness and agenda driven wicked hearts so that we can love freely through dignified interdependent relationships. Through repentance of our sins and placing our faith in Christ, his Spirit now leads to the Island of Peace within our souls in order to love freely through dignified interdependent relationships. We then begin to live into this as a glimpse of what is to come when Christ comes to renew all things, and if you are like me, you will probably mess it up and have to start again, daily. This is why we rest in the fact that we have a “God who wastes nothing.” He takes all of our messes, selfish desires, wrong motives and failures and uses them for his glory. I rest in what Paul says Philippians 1, “But what does it matter? The important thing is that in every way, whether from false motives or true, Christ is preached. And because of this I rejoice. Yes, and I will continue to rejoice.” The reality is, loving freely is not up to us. This doesn’t mean we are not called to be faithful and obedient, it just means that it’s not up to us to get it right. So, how does this apply with a particular relationship? I had an experience recently with my wife, which she did not say what my false self wanted her to say. I was triggered and got upset because I wanted her to say something to validate me and make me feel safe. 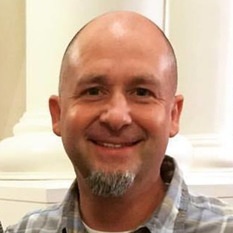 Because of learning to love freely, I was able in a few moments to hear God’s voice, be reminded of my original glory, name what my false self wanted, ask Christ to release me of this and was able to receive what my wife was offering. I was then able to return through the Spirit’s leading to the Island of Peace within my soul. Another example of how the false self that comes out of no where. I was talking to a group of friends about what Jesus is doing in our lives and I offered to send a particular friend some content that I’ve developed that has greatly helped me in my walk with Christ. His response was “no”. I immediately reacted in shame thinking that the content that I had developed was bad and wouldn’t help anyone. I had to step back and ask, what is my heart longing for in this situation? I wanted to be affirmed for what I had developed. I named it, confessed it to Christ and was able to move on. Upon further clarification, he was merely joking and pulling my leg. But, the trigger happened and pulled me off of my Island of Peace with Christ and by the grace of God was able to name what needed to be named and asked the Spirit to remind me of who I am in Christ. If, we are loving freely we can quickly make a decision based on knowing who God has created us to be, name what our heart is longing for, ask Christ for forgiveness and that his Spirit bring us back to our Island of Peace, being reminded of who God has creates us to be and then rest in the fact that God is wasting nothing as we mess it all up and have to start again. This circular process is going to happen again and again and again. The creation, fall, redemption, and completion narrative is happening all of the time in our relationships, jobs, families and particularly when we love and serve others, particularly our friends on the margins. I hope this process is a blessing to you as Christ has really used it in my life to draw me closer to Him and his heart for the vulnerable in our community.